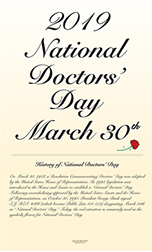 National Doctor's Day Greeting Cards, Doctor Gifts 2015 FREE POSTER. Sign up here for our email reminder for Doctors' Day and you receive and early bird coupon each year along with downloading they yearly FREE 8.5 x 14 full color Doctors' Day poster pdf. The pdf is high resolution and you can print as many as you need! Even If you decide to opt out of the email reminder, you can keep the link to the poster handy, as it will be updated each year for you to download.